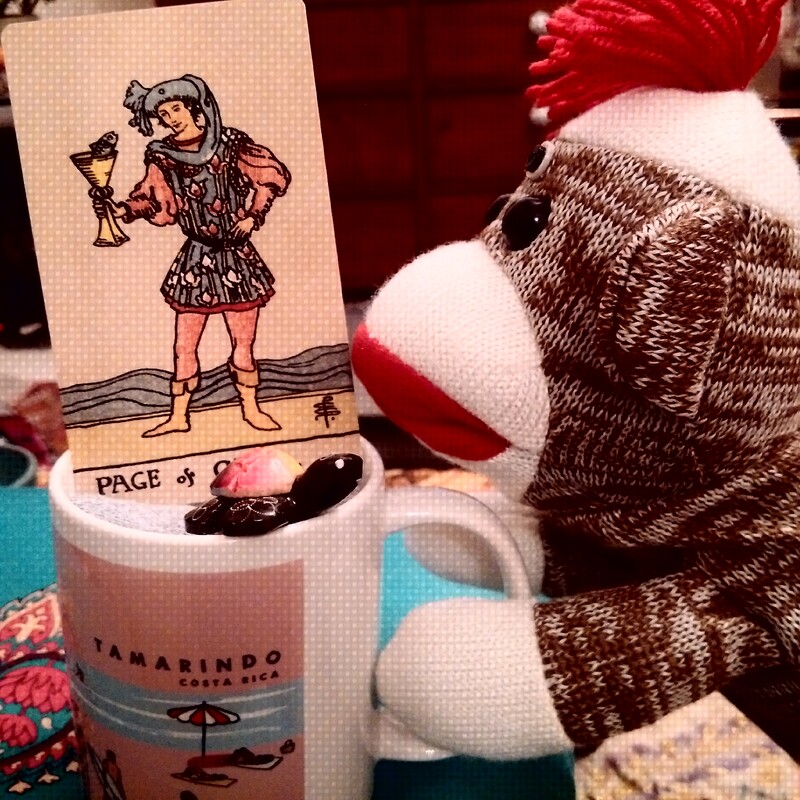 So here we are, with the Page of Cups! I have a tendency to see this guy and automatically think, aw crap, I’m being too fanciful and immature again…which is of course what this card can mean, but it doesn’t always have to be that negative. It can also give props to our imaginative selves full of whimsy and creativity. Our child at heart who would not only delight in finding a fish in her cup but also carry on a conversation with it as well–y’know, in a cute and clever and not alarmingly crazy way. Within the tarot court cards, Pages can represent a young person in our life or our own youthful aspect (or early stage in a new endeavor). And when it comes to the tarot suit of Cups, we’re working within the realm of emotions, intuition, creativity, and spirituality. The soft, soothing blues of this card and the gently undulating waves in its background give an easy-breezy impression of just going with the flow, wherever your whims may take you. A blessing for new beginnings. There’s of course still that caution that I opened with, though, as Pages in their innocence can also be naive and in need of more experience and doses of reality. As with all tarot cards, however you take this one can depend on its context and perhaps if it’s reversed or not (if reading reversed cards is your thang–it’s mine but not everyone’s). But overall, it can’t help but be a delightful little messenger, with a freedom and lightness that gets a bit lost by the time this Page ages into the King of Cups. This entry was posted on Wednesday, October 3rd, 2018 at 22:29	and tagged with learning tarot, one card draw, Page of Cups, Rider-Waite-Smith Centennial, Tarot, tarot court cards, Tarot Journal, tarot reading and posted in Mystic Monkey, Tarot Journal. You can follow any responses to this entry through the RSS 2.0 feed.